MY BLOGS » Take a 3 MINUTE Mindful Tea Meditation! Good morning, Dyan here (The Health Coach Is In) to share with you, on this chilly morning, how you can take a little break to improve your health and rest your mind with just a few minutes of a mindful tea meditation. Every tea is unique in color, taste and health benefits. Tea has been an important beverage for over a thousand years and has been a huge part of many different cultures around the world. Because tea has less caffeine than coffee, making our systems feel less jittery, so we can fall asleep. Tea helps us stay hydrated and provides an array of antioxidants while doing so. And tea can help us feel calm and relaxed. So what better way to recap the health benefits of tea than in a 3 minute mindful tea break where you'll feel even more relaxed and peaceful than you ever knew was possible. So take a few minutes and follow the 7 steps to a Mindful Tea Meditation and reap the benefits, too. First, hold your cup of tea in your hand and just gaze at it. Notice the way the lights and shades fall on it. Is it lighter on one side more than the other? Notice how it reflects light and the different colors the reflection gives to it. For instance, if it's a brown cup, is it just one shade of brown all over? Or is it many shades of brown? Secondly, look at the surface of the tea itself. 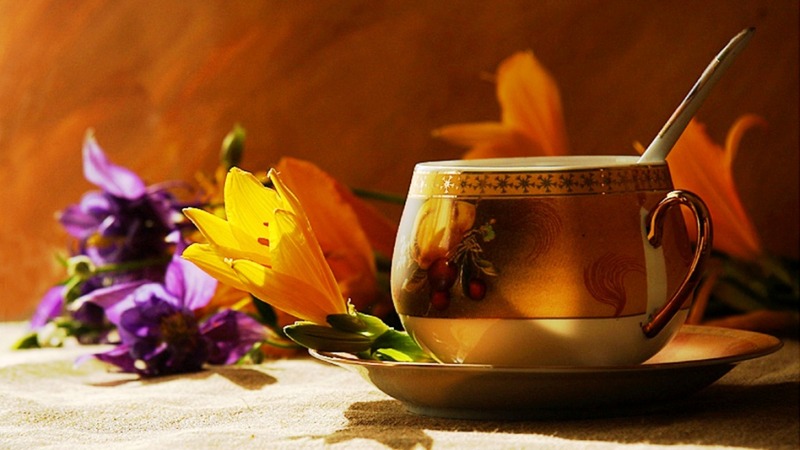 Notice the colors, reflection and the shades on the surface of the tea. Notice the steam coming off the surface. Now, feel the cup in your hand. Feel the sensations of the heat on your skin. How heavy does the cup feel? Next, bring the tea to your nose and breathe in. Does it have an aroma? Close your eyes and concentrate on the scent of the tea. Is it strong? Is it subtle? Do you feel the steam on your face? Are you thirsty to want to drink the tea? What does your thirst sensation feel like? Bring your cup to your mouth and feel it on the rim of your lips. What does that feel like? Now take a sip and hold the liquid in your mouth for a few seconds. What does the tea taste like? Lastly, swallow and feel the tea slip down your throat. Is it warm? Is it comforting? There you have it 7 Mindful Steps to help you take a 3 minute tea break. So what did you think? Did you try it? Did you feel a little calmer? Whether you're drinking your warm tea mindfully or sipping it iced cold while on the go, tea is fabulous and so are all of it's benefits.